This topic describes how to change the way Tableau Bridge client runs, or change the computer or site that a Tableau Bridge client is associated with. 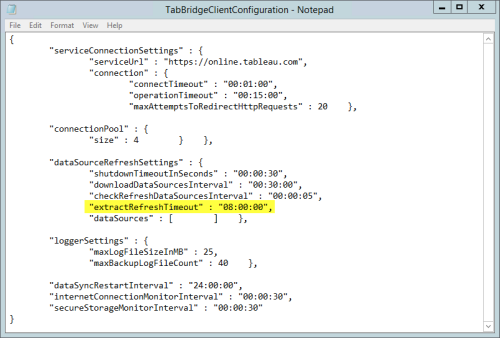 You can set Tableau Bridge to run as a Windows service, so it can keep running your refresh schedules or live queries even after you log off Windows. You can do this if the Windows account that runs Tableau Bridge is a local administrator on the computer. Open the Windows system tray, and select the Tableau Bridge icon to open Tableau Bridge. Near the bottom of the window, for Mode, select Service. A sign-in window appears, prompting you to enter Windows credentials. For example, enter your own credentials if you are a local administrator on your computer. In your list of Windows services, Tableau Bridge appears as Tableau Bridge service. You can see this in the Windows Services console or on the Services tab in the Task Manager. Near the bottom of the window, for Mode, select Application. When Tableau Bridge is running in Application mode, it can refresh extracts and allow live queries only when you or your users are logged on to Windows. For more information, see How does it work?. When you publish an extract data source, you can set up a refresh schedule for the data source. As part of the schedule, you can specify the computer. The computer you specify is the Tableau Bridge client that performs the extract refresh. If the computer you want to select is not available from the drop-down list in the Schedule an Extract Refresh dialog box, in addition to being the data source owner or a site administrator, you must sign in to that client. If you don't have the client on your computer, you must download and install it. For more information about installing Tableau Bridge, see Install Tableau Bridge. Note: Alternatively, if you don't want to maintain the published extract data source yourself, after publishing the data source, you can ask your site administrator to either reassign it to a different client or to manage the data source using a centrally-managed client. For more information, see Manage data sources using a centrally-managed Tableau Bridge client. You can change the Tableau Bridge client used to perform the scheduled extract refresh of a data source. You can only assign the extract refresh schedule of a data source to a client that you are signed in to. Click the name of the data source and click the Extract Refreshes tab. On the right side of the page, click the button next to Refresh this extract on. In the Change Refresh Schedule dialog box, select a different computer (that is the client) that you want to perform the scheduled extract refresh, and then click Save. Note: If the data source requires a user name and password to access the underlying data, open the client on the new computer, and edit the connection information to embed the database credentials. You can use the Test Connection option in the client to check whether the data source can access the underlying data. Sign in to Tableau Online as an administrator, go to the site’s Settings page, and click the Bridge tab. In the Type column of the table that lists registered clients, select Extract and Live next to the name of the new client. The data sources that contain live connections and are managed by Tableau Bridge are assigned to the new client. As an administrator, you can perform extract refreshes for data sources using a centrally-managed client. To designate a client as the central client, simply reassign the extract refresh schedules of multiple data sources to a specific client. Follow the steps in Change the Tableau Bridge client that performs the scheduled refresh from Tableau Online to assign the extract refresh schedule of a data source to a central client. Note: If you’re using the same central client to handle both scheduled extract refreshes and load balancing of live queries, performance of the client could be affected if there are a significant number of live queries processing at the same time. To optimize for performance, Tableau recommends that you designate one central client to handle extract refreshes and designate a second client to handle the load balancing of live queries. When you want a Tableau Bridge client to refresh data published to a different Tableau Online site, you unlink the existing client and sign in to the new site. Open the Tableau Bridge client icon in the Windows system tray, and select Unlink. This removes the list of data sources, schedules, and connection information from the client. In Tableau Desktop, select Server > Start Tableau Bridge Client, and sign in to the new site. If this client refreshes extracts, configure its data sources and refresh schedules. If you want this client to maintain live connections, you need to have administrator access to the Tableau Online site. On the site Settings page on the Bridge tab, you select Extract and Live for this client in the Clients Status table. When you unlink a Tableau Bridge client, a site administrator might also need to remove the refresh schedules it was associated with on Tableau Online. For more information, see Effects of exit and unlink in the topic Stop Tableau Bridge Refreshes. To ensure that long running refresh tasks don't prevent other extracts from refreshing, you can enforce a time limit, also known as a timeout limit, for refresh tasks performed by a Tableau Bridge client. The timeout limit is the longest allowable time for a single extract to complete a refresh task before it's canceled. By default, the timeout limit for a client to perform a refresh task is set to 24 hours. If a refresh task exceeds the timeout limit set in the client, the client cancels the refresh task. If an extract refresh is canceled as a result of a timeout, you will be notified in the client and an email notification will be sent to the data source (in this case, extract) owner. You can change the timeout limit for a client through the Tableau Bridge configuration file. Note: The client must be restarted for any changes made to the configuration file to take effect. On the computer where the client is installed, go to the Configuration folder in the My Tableau Bridge Repository. The default location of the Configuration folder is C:\Users\jsmith\Documents\My Tableau Bridge Repository\Configuration. Next to extractRefreshTimeout, change the time allowed for a refresh task to complete. Note: If you don't see the parameter in the configuration file, you can add "extractRefreshTimeout" : 08:00:00", to the dataSourceRefreshSettings setting like in the example below. Exit and restart the client for the changes to take effect. The way you restart the client depends on whether the client is running in Application or Service mode. For Application mode: from the client menu, select Exit. For Service mode: from the Mode drop-down menu, select Application; from the client menu, select Exit. The Tableau Bridge client creates logs of activities as part of its normal operation. You might need to use these logs when you are troubleshooting issues with Tableau Bridge or if Tableau Support requests logs from you to help resolve an issue. By default, the maximum size allowed for a Tableau Bridge log files is 25 MB. When a log file exceeds that size limit, a new log file is created. When the number of log files reaches 40, which is the default value for the maximum number of allowed log files, the oldest log file is deleted. You can change the default values for these parameters through the Tableau Bridge configuration file. Exit and then restart the client for the changes to take effect. The way you restart the client depends on whether the client is running in Application or Service mode.